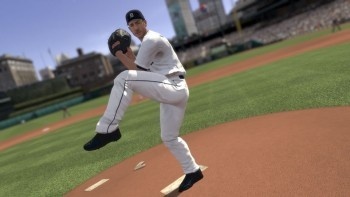 2K Sports is offering a million bucks to the first gamer who can pitch a perfect game in the upcoming Major League Baseball 2K10. A perfect game in baseball is defined as one in which a pitcher or pitchers earn a victory over a minimum nine-inning game while allowing nobody from the other team to reach base: No hits, no walks, no passed balls , no nothin'. It's not easy - it's only been done 18 times in the history of Major League Baseball, stretching all the way back to 1880 - and 2K Sports is so confident in the realism of its newest baseball sim that it's offering a million bucks to the first person who can toss one. "You don't see too many perfect games thrown in MLB 2K, but we've seen it happen," said Jason Argent, vice president of marketing at 2K Sports. "Our goal is to celebrate and highlight Major League Baseball 2K10's superior pitching and hitting mechanics this season, while also giving one of our loyal fans the thrilling opportunity to be rewarded with a lot of money." "Every baseball fan knows pitching a perfect game is one of the most difficult and rarest accomplishments in all of sports, and that's what makes this million dollar contest so compelling," added Tampa Bay Rays third baseman Evan Longoria, the Major League Baseball 2K10 cover athlete. "This is the chance of a lifetime." There are, of course, some rules to the game. Players must be connected to either Xbox Live or the PlayStation Network, play the game in "MLB Today" mode and, after selecting one of the available matchups, opt for the "Major League Baseball 2K10 contest," which will automatically set the proper gameplay options for the contest. Games must be recorded with a camera or digital video recorder in compliance with guidelines and blah blah blah. 2ksports.com/perfectgame has all the details. So get your Crisco, Bardol, Vagisil and snot ready: Major League Baseball 2K10 comes out on March 2 for the Xbox 360 and PlayStation 3.